With the news today that E.J. Manuel is having a private workout with the Bills today, one can see the lengths the Bills are going to to make sure they get the right QB in this draft. The Manuel workout comes just a day after the Geno Smith workout. Bills GM Buddy Nix has said publicly that they will make sure they see all of them. And he indicated that with some it would be both off site (for workouts) and at the team facility (1 Bills Dr). I would anticipate pre-draft visits to be the last step of the process sometime next month. NFL Network draft analyst Mike Mayock took in Florida State QB E.J. Manuel’s pro day in Tallahassee Tuesday and believes he’s the type of athletic quarterback that NFL teams are more willing to take a chance on because of their high ceiling. As a result he believes Manuel comes off the board in late April before round one is in the books. Mayock moved Manuel up to his number two quarterback prospect behind Smith and said at this point he’s a better prospect than his predecessor at Florida State Christian Ponder was coming out because his ceiling is higher. Mayock said he had a second-round grade on Ponder coming out, but he went 12th overall to Minnesota. At this point he’s not sure Manuel gets out of the first orund. “At this point the way kids are getting pushed up in this draft, and I’m anxious to see Barkley next week, because again bad senior year, good junior year, but the way kids are getting pushed up at quarterback it wouldn’t surprise me at all,” Mayock said. Most NFL draft prognosticators are locking in a quarterback for the Bills with the eighth overall pick in the draft now that Ryan Fitzpatrick and the team have parted ways. The mock drafters at OptimumScouting are no different. In their latest mock, they’ve got the Bills taking Matt Barkley eighth overall. Interestingly they’ve got Geno Smith going second overall to Jacksonville. Here’s what they wrote about the pick for Buffalo. Now that Ryan Fitzpatrick is gone, it’d be a shock if the Bills didn’t take a quarterback here. It’s tough to peg which one they’ll target at #8. Doug Marrone has raved about Barkley in the past, so he gets the slight edge over Marrone’s former QB Ryan Nassib. What’s perhaps even more interesting is how OptimumScouting sees the second-round quarterbacks coming off the board. He has Philadelphia taking Florida State’s E.J. Manuel with the 35th pick, Arizona taking Arkansas’ Tyler Wilson with the 38th pick and the Jets one pick later (39th) taking Syracuse’s Ryan Nassib. NFL Network draft analyst Mike Mayock has changed his top five quarterback rankings elevating Florida State’s E.J. Manuel to number two on his list. When asked why he moved Manuel up in his rankings, this was his response. Mayock made it clear that he’s far from enamored with the quarterback class, but sees Manuel as a worthwhile risk. It’s pretty clear that West Virgnia’s Geno Smith was the top arm on the field Sunday at the quarterback workouts in Indianapolis. But what about the rest of the QB prospects at the NFL combine? –Ryan Nassib of Syracuse looked okay during the session, nothing spectacular. His smooth footwork was on display during some five-step drop passing routes. He did have back to back overthrows on a couple of deep balls. And Nasib had the sleeves of his UnderArmour workout shirt cut off at the shoulder, perhaps an attempt to impress observers with his upper body. –Tyler Wilson of Arkansas looked better on deep passes than on the short ones, which is strange. His footwork is always solid. He came up way short on an out pattern pass, which is noteworthy. Wilson was not overly impressive. 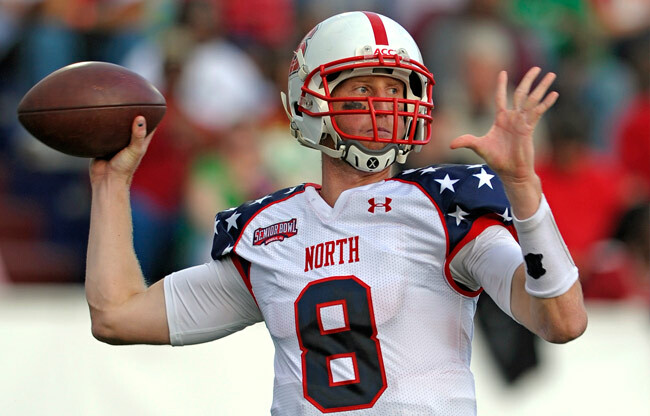 -North Carolina State’s Mike Glennon was tough to watch. Not only is he tall and somewhat ungainly, he’s got a long windup in his throwing motion that is tough to ignore. One former NFL GM mentioned this week that Glennon needs a lot of work, and does not belong in the top tier of QBs in this year’s mix. –E.J. Manuel looked much the same as he did during Senior Bowl practices last month–inaccurate and inconsistent. The FSU QB played well in the Senior Bowl game, and his athleticism and stature are tough to ignore, but he does not appear to be an elite QB prospect. -The best of the rest was probably Arizona’s Matt Scott. He’s an imposing athletic specimen and he came up with some impressive throws during the Sunday workout. As a one-year starter, he’s got to be regarded as a project at the position. Here’s the latest Super Bowl week edition of Fan Friday with your questions from AskChris@bills.nfl.net and from Twitter @ChrisBrownBills. @ChrisBrownBills is E.J. Manuel a good fit for Buffalo? CB: It’s hard to say who is and isn’t a fit since there isn’t a definitive approach to what Buffalo’s offense will look like. Yes, we know that the offense will be rooted in the west coast system, but it has been very varied and unpredictable under Nathaniel Hackett when he was at Syracuse. Hackett naturally prefers to be unpredictable. At the same time Hackett will be looking to improve and advance the offense and suit it to Buffalo’s personnel. Manuel certainly offers the physical skills necessary to play at the NFL level. His decision making and deep ball accuracy have been questioned by some. A good number of talent evaluators out there do not think he’s a finished product suitable to lead an offense from day one. As to whether he fits what Buffalo wants to do I’ll let Buffalo’s offensive coordinator answer that. I’ve heard it talked about amongst fans for a long time, do you ever foresee the Bills re-aligning to the AFC North by swapping with Baltimore? I think the proximity of Cincy, Cleveland and Pittsburgh would create outstanding rivalries, with all 4 teams being within a few hours’ drive of each other. Baltimore would seemingly be a better fit for the East, being that NY, NE and Miami are all along the coast as well. Your thoughts? CB: I have felt the same way for a long time. When realignment occurred in 2002 I thought that was the best case scenario for the Bills long term, but I think the preservation of classic rivalries like Miami carried the day and kept Buffalo in the East. Geographically it makes way too much sense. Unfortunately I don’t foresee a change, especially with the Baltimore-Pittsburgh rivalry being the fiercest in the NFL in my opinion. Hey @ChrisBrownBills what are chances #Bills draft 2 QB’s? Besides backer and maybe free safety, what are other needs? CB: I tend to believe that will not be the case. Buddy Nix mentioned a month ago that he said they will try to draft one and perhaps add another in free agency. I think the free agent crop is thin, but it’s my feeling that Nix and his staff would prefer to add a veteran free agent in addition to rookie. Whether the opportunity presents itself to acquire a pair of quarterbacks along those two avenues is another story. CB: We have a story that will appear on the website about the nuts and bolts of what the new coaching staff is doing at this time. They’re evaluating cut-ups of the Bills 2012 season by position and as offensive and defensive units. Every player will have a report put together on them by the staff. There will also be a good deal of time spent by the staff on reviewing their offensive and defensive schemes, how they apply to the talent on Buffalo’s roster and how said systems can be improved for the better. All of this takes a good deal of time. Thanks for your great work. My question is about Tarvaris Jackson. Initially, when the Bills traded a draft pick to Seattle for him and became responsible for his 2012 salary, everyone assumed he would become the Bills backup QB and Thigpen (who had been unproductive in pre-season) would be cut. Then the Bills said Jackson did not know the offense well enough to be the backup, and Thigpen stayed on the roster after final cuts. But Jackson remained inactive for every game, and by mid-season the Bills said it was impossible for Jackson to learn the offense well enough to play because there was not enough practice time to give him snaps with the first team offense. Jackson remained inactive the entire season and is now an unrestricted free agent. If the Bills’ explanation is correct, and it is impossible for a veteran QB to learn the Bills offense during the season because there is not enough practice time, why did the Bills give up a draft choice to get him when training camp was over? CB: Buddy Nix has said more than once that the Tarvaris Jackson trade was a move made purely for insurance. With the Vince Young situation not working out, Buffalo had a short window to address the vacancy at the QB position without a lot of options out there short of a trade. Jackson was acquired for a seventh-round pick in the event that Ryan Fitzpatrick was hurt and out for an extended period of time. Short of a long term injury to Fitzpatrick, Jackson was never going to see the field. To be fair to Jackson, he knew and understood the offense. The bigger issue was the previous coaching staff did not see Jackson under live fire before in their offensive system. That gives coaches ulcers when they have to put a player on the field without any prior knowledge of what they’re capable of when the real bullets are flying. So while Jackson did his due diligence to learn the offensive system he was never afforded the opportunity to execute it in the practice setting due to time constraints. That left the previous coaching staff without any way to develop confidence in Jackson since they never saw him execute it effectively. It was very much a catch-22. Former NFL safety and National Football Post correspondent Matt Bowen wrapped up his trip to Mobile with 10 observations from the Senior Bowl. He began with the questions at the quarterback position. Bowen, who often speaks with NFL scouts during the week he’s at the Senior Bowl got a very interesting variety of opinions on the signal callers that were practicing this week and put it in his top 10. What I found most interesting with this comment was no mention of Arkansas QB Tyler Wilson, who was getting some positive reviews in Mobile this week. E.J. Manuel played in more of a pro-style offense at Florida State, which stretched the field and differed from the more popular spread and read option attacks in college. But Manuel feels his athletic ability makes him a fit for that kind of offense as well should it be the one he has to execute in the NFL. Manuel met with the Eagles and their new head coach Chip Kelly, who also recruited Manuel out of high school. Florida State QB E.J. Manuel, who is participating for the South team at the Senior Bowl practices this week realizes an NFL team will pick him, not the other way around. But the eager senior signal caller would prefer to go to a team with more uncertainty at the quarterback position. Manuel met with the Bills earlier this week, just like the other five quarterbacks participating at the Senior Bowl. ESPN NFL draft analyst Mel Kiper was breaking down quarterback prospects in the draft pool this year on a national conference call and was asked which QB he’d pick first between N.C. State’s Mike Glennon, Syracuse’s Ryan Nassib and Florida State’s E.J. Manuel. Here was his answer. “To me Glennon at 6’5 ½” played for Tom O’Brien and Dana Bible, the same guys that developed Matt Ryan,” said Kiper. “They see similar characteristics to Ryan with Glennon. Glennon was there and he’s why Russell Wilson ends up at Wisconsin. Glennon you look at the talent around him and how many dropped balls were there? Kiper said he’d take Nassib next in that trio and Manuel third. All three quarterbacks are taking part at the Senior Bowl. Hey Bills fans, sorry for the delay. We had a publishing failure for Fan Friday. Here is the latest edition of your questions straight from AskChris@bills.nfl.net and Twitter @ChrisBrownBills. Let’s get to them. CB: To my knowledge alternates are selected based on who got the next most votes from players and coaches. So team coaches do not get to choose. For example, Calvin Johnson pulled out of the Pro Bowl and replacing him was 1st alternate Vincent Jackson. Jackson was next up because he got the next most votes. FYI C.J. Spiller confirmed he’s a 1st alternate for the AFC on the John Murphy Show last week. What are the early scouting reports saying about Tyler Wilson and E.J.Manuel? I think the Bills need an accurate quarterback above all else and these two might fit that mold. They may not have the biggest ceilings, but I like what I saw from them this season. Can they fit in any scheme? CB: I think it’s safe to say that Wilson has the arm strength to fit in any scheme, and he has shown the ability to make good decisions on the fly in terms of manipulating the pocket to buy time, throwing a receiver open, etc. But only the guys that scout these QBs for a living know for sure. With respect to Manuel there is no debating his physical tools, but his decision making is what pops up as a criticism among NFL scouts. Against the better defenses he faced Manuel struggled with his decision making. Fortunately for Manuel he’ll be able to go against some of the best college competition next week at the Senior Bowl along with Wilson and you can draw your own conclusions. Thanks for all the latest info, I look forward to fan Friday every week. My question has to do with our upcoming pick in the NFL draft. Have you had any indication that we are seriously considering Mike Glennon with the first round pick? This guy is the real deal! I might be jumping the gun a bit, but this guy looks like he has Tom Brady/Aaron Rodgers type potential. Most draft scouts have him rated as a 2-3 round pick… But I really doubt any die hard bills fan will regret “reaching” and taking a chance on a potential franchise QB. The time is now! He doesn’t have Geno Smith type stats; however, he rarely got to experience much time in the pocket and when he did, the receivers would drop a large amount of catchable passes. Even when they were perfect throws. I’m hoping the Bills have been scouting this guy since last year and that is one of the reasons buddy was so comfortable taking TJ Graham so high in last year’s draft. I’ve heard all the buddy nix interviews and he has expressed interest in getting a QB if he is there… I want to know what you think they will do? As you can tell, I’m pumped about this offseason. Unfortunately, the offseason has been the best part of being a Bills fan for a long time. CB: First of all if you think that Buddy Nix or any member of his personnel staff reveals their true leanings with respect to prospects in the draft you’re crazy. It’s full lockdown mode with the personnel department this time of year and you can understand why. Glennon is highly touted in what is considered a down year for quarterbacks. He’s got a great arm and yes you’re right his offensive line was not great. Mobility is an issue, but he’s got experience in a pro system. Buddy Nix at the end of the season on his radio show didn’t deny he was a guy they’ve looked at. Truthfully though they’ve looked at all the quarterback prospects that are worth their salt. So read into it what you want. The bottom line is Nix has said they’d like to draft a future franchise QB. The question is will the draft fall or the Bills make a move to ensure that happens? I know it’s early I’m looking at the top end of the draft I’m not liking the quarterbacks or the idea of drafting another defensive lineman, would they draft another tackle and maybe put Cordy Glenn on the right side or is there a wide receiver worth taking? I’m assuming Jarvis Jones won’t be around at 8 do you think Manti Te’o would be a good fit with the Bills? I know free agency will influence what direction they go in the draft, Buddy mentioned possibly a quarterback in free agency I looked at the list and unless Mike Vick is added to it I’m not convinced there is anybody available that is any better than Fitzpatrick I’m kind of hoping they either trade for someone or stay the course, what do you think of the quarterback situation and the top of the draft? Thanks for all you do! CB: There have been a couple of wide receivers that are viewed as first round picks, but not true top 10 selections. I don’t see Buddy Nix as the type that would take a receiver that high. Tennesee’s Cordarelle Patterson is an intriguing physical specimen, but there’s not much of a college track record there with just one year of FBS competition. I’d much prefer a guy with more of a resume of production like Baylor’s Terrance Williams or Cal’s Keenan Allen. All three though should come off the board in round one or early second round. You’re probably right on Jarvis Jones. Most see him as a top 5, but his spinal stenosis might concern some and he could slip. Te’o is a LB that has been projected to the Bills in mock drafts (see: Mel Kiper), but I want to see how he tests at the Combine in the drills. The whole Notre Dame defense played poorly in the National Championship game, but I’d imagine that Te’o’s performance might necessitate a good showing at the Combine to re-assure scouts. Still, he’s widely seen as a mid-first rounder at worst. I think Alex Smith will be there in light of his contract situation, knowing his $7.5M salary is guaranteed if he’s still on the 49ers roster April 1st. I don’t know at this time whether the Bills see him as a viable option, mainly because they can’t comment on players still under contract with other clubs. Nix has said they would like to draft one and get one in free agency, so there’s a good chance they add more than one. The draft prospects aren’t top flight, elite talents like the ones that were in the draft pool last season, arguably the best QB draft since 1983. But guys like Geno Smith, Mike Glennon and Ryan Nassib could sneak into the first round knowing the premium placed on the position, provided a team needing a QB (KC, AZ, Buf) decides to make the move back into the first. CB: I think if you used Marrone’s record at Syracuse as a barometer to measure his future success in the NFL you’re making a big mistake. Syracuse was a wayward program when Marrone took over. They won just 10 games in the previous four years before Marrone took over. He won 12 in his first two seasons including an 8-5 campaign in 2010. Marrone made very solid choices for his coordinators. Hopefully you saw our story on the website about their expertise. His understudies from Syracuse largely include assistants that have either coached or played in the NFL. I think Marrone will quickly establish a rapport with the players and get more out of the talent that exists on this roster. There won’t be any rebuilding. This is a regrouping effort, and Marrone I think could prove to be one of the better hires for head coach for this franchise in quite some time.